Our dog recently had an accident damaging his dew claw and he needed a procedure to have it cut all the way to the quick. As we had planned on having him neutered for some time already, (and the prospect of keeping a hyper active dog on the lead for two separate week’s recuperation wasn’t very tempting) we decided to kill two birds with one stone. This meant there were two areas our dog was not allowed to lick for the coming week - his right front paw and his genital area. 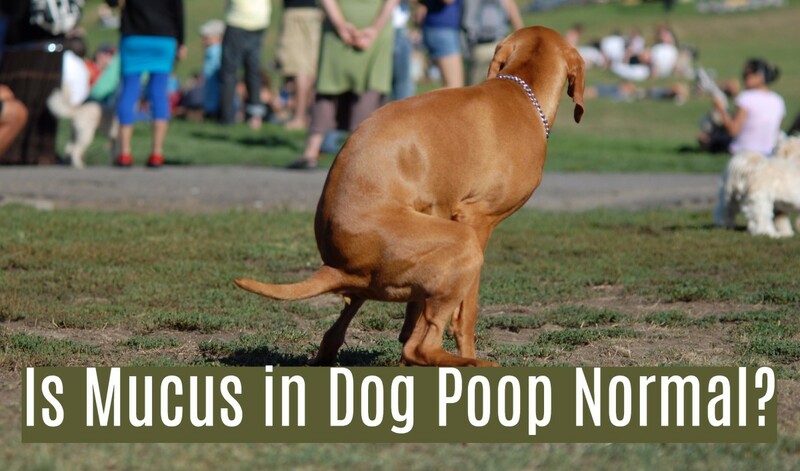 And all dog owners will know just how easy a challenge like that can be! When we picked him up at the vets we were handed the obligatory Elizabethan collar, or e collar as its sometimes also called. 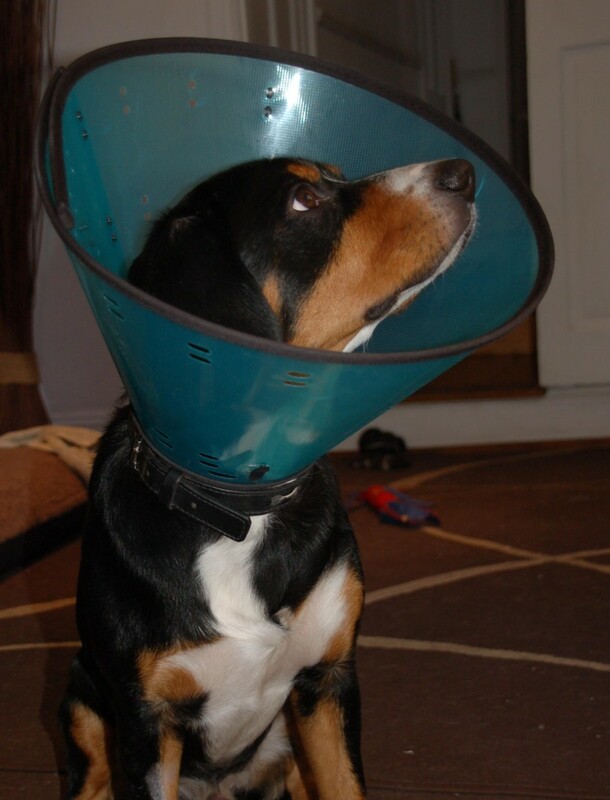 Its the one that looks like a lamp shade or a cone and goes on the dog’s neck. All dogs I’ve ever known hate them. We were told we could supervise our dog during the day, but that he would have to wear the cone at night to stop him from licking his wounds and bandages. He hated the cone straight away and didn’t sleep one wink the first night - he just kept whining until we took the cone off in the morning. These are the five alternatives to the traditional E-Collars that I researched. Each come with their own pro's and con's. 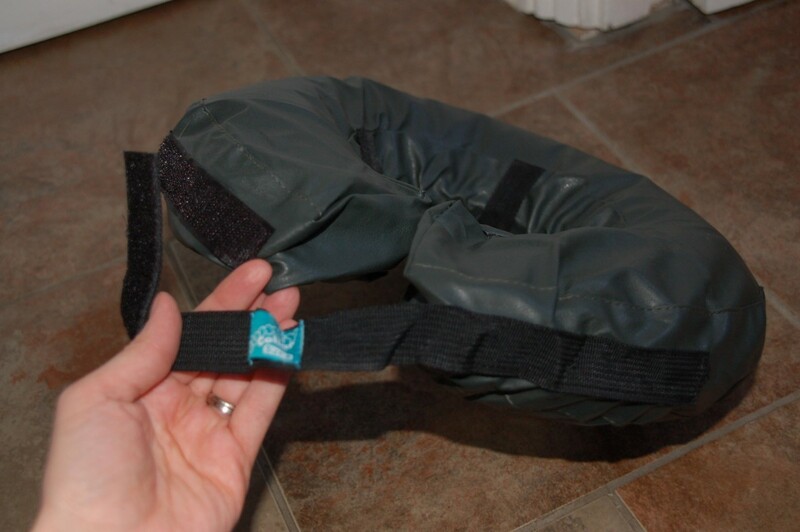 These look exactly like the classic E-collars, but they are made from a softer, more comfortable material. They are not strong enough to prevent a very persistent or intense lickers from reaching their targets, but can provide a comfortable alternative for most pets. 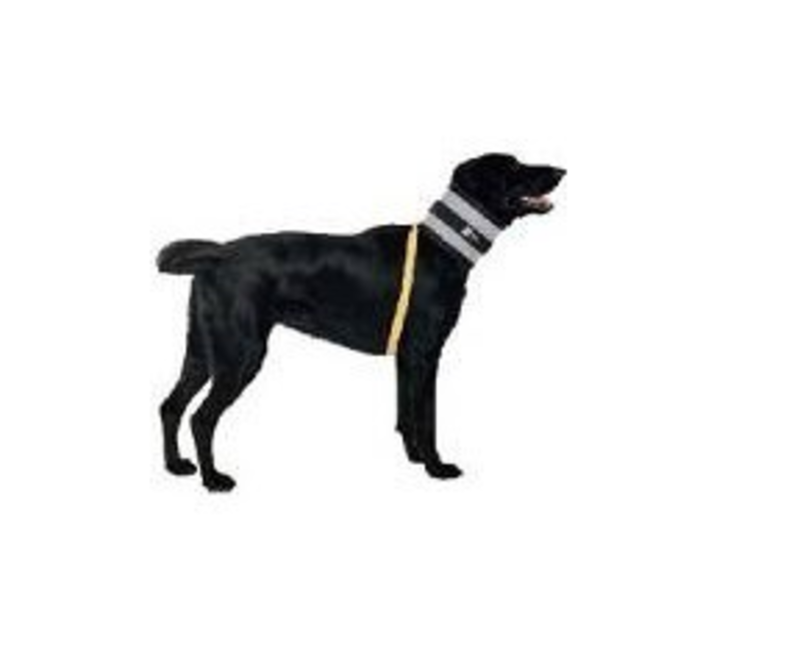 These Bite Not collars look a little like the neck brace humans patients might wear after a whiplash injury. They prevent your dog from bending his neck and reaching his wounds, and are really effective and relatively comfortable, although probably not the best choice for dogs with fat necks like pugs, or long haired dogs like the Bearded Collies. These collars look a lot like the classic Elizabethan collars, but they are transparent which will make your dog’s life a whole lot more comfortable. Some people claim these bitter tasting sprays work for their dogs, but I have tried three different brands on my dog back when he was teething and he didn’t seem to take notice of either of them. This is the alternative I chose to order, and I have reviewed the product in more detail below. Watch out for the peanut butter test! Let's first have a look at the traditional E-Collar which is the protective collar that most vets recommend after your pet has had surgery. They are made from hard wearing plastic and often opaque, looking a bit like your dog is wearing a lampshade. 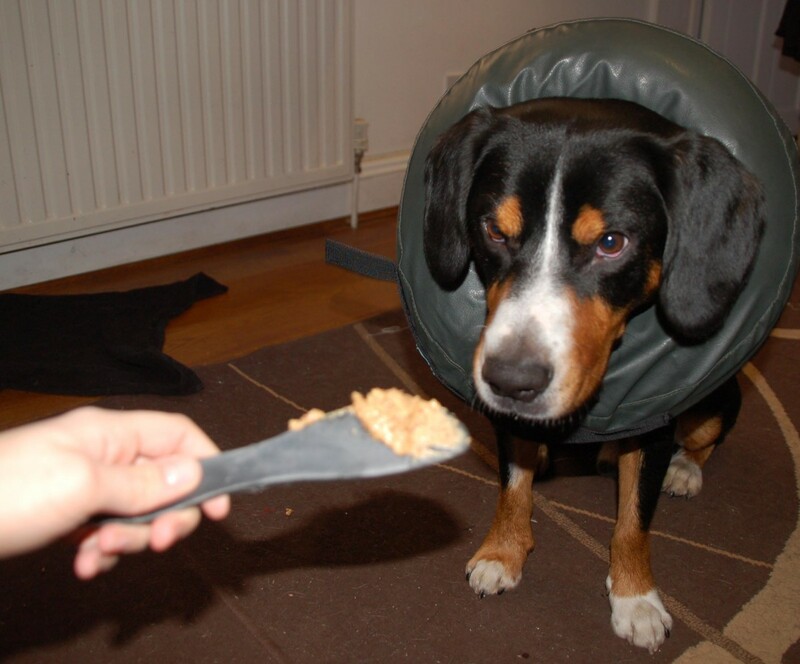 The cone was easy to attach around our dog’s neck, and completely prevented him from licking any part of his body. He became more sensitive to any sounds coming from outside the house - I can only assume the cone amplified the sounds. The cone got in the way of interacting with the dog. He kept slamming the cone into my legs and face, which got really annoying after a while. The cone seemed to depress him, he whined the entire first night he wore it and he couldn’t relax or find a comfy position for sleeping. The cone would snap open and fall off when he bumped into something while running. He avoided his water bowl for as long as the cone stayed on. Vomiting in the cone became a very messy business. 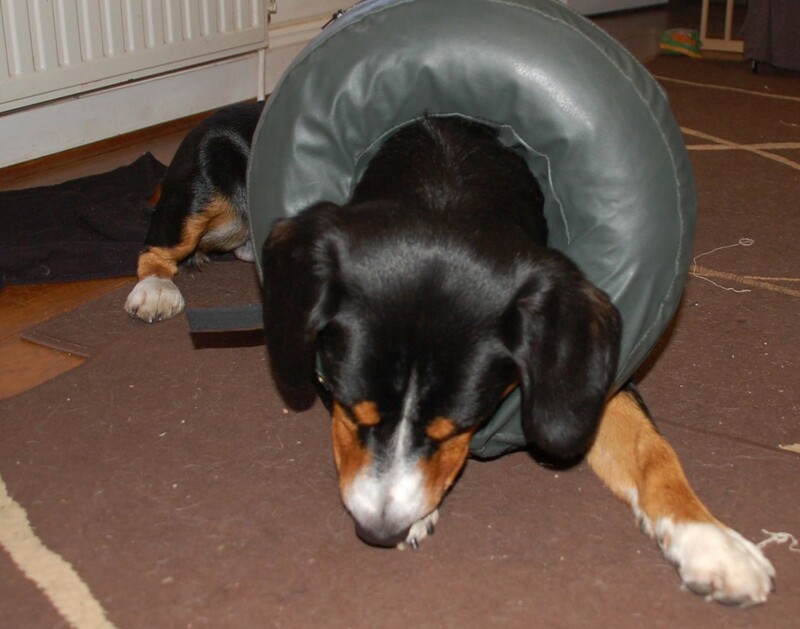 The inflatable collar is a doughnut shaped version with an inflatable core and a durable cover. It straps on with a velcro strap, and you have the option of attaching it to your dog’s collar for extra security. They look a bit like the sort of pillow you buy and use for a long haul flight. They come in many different makes and colours, but the brand I chose was easy to inflate and attach. After an initial sniffing, my dog didn’t seem to notice the collar was there and he completely ignored it. He quickly found a comfy spot and fell asleep, the collar seemed to act like a comfy pillow. Although he ran into things with this collar too, the impact was cushioned and didn’t seem to bother him at all. 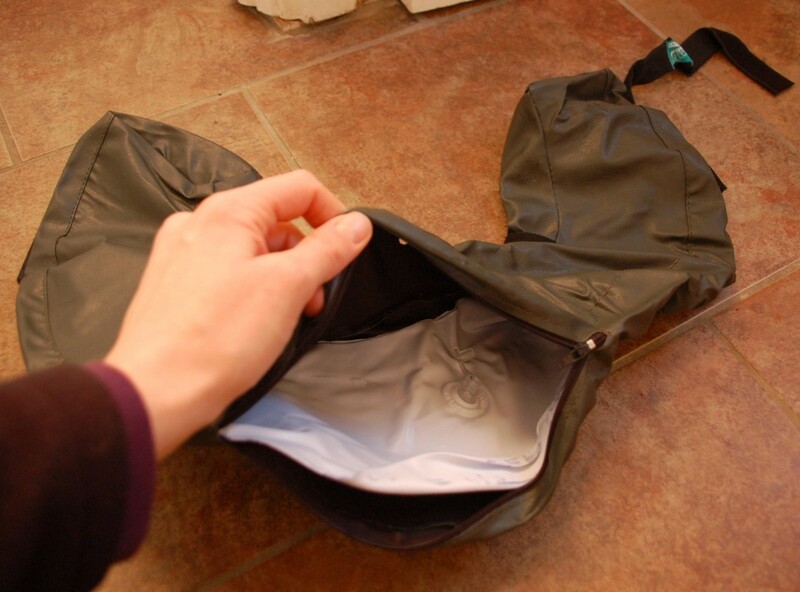 The blow up collar is less intrusive, allowing you to cuddle and stroke your dog as usual. His peripheral vision and hearing were not impacted to the same extent as with the cone, and he seemed much calmer wearing the inflatable collar. He could drink and pick up his toys freely and without problems. Where there really no problems with this collar I hear you ask? As soon as I saw my dog wearing the inflatable collar I wondered if it could really prevent him from reaching and licking his paw and bum. It looked way too soft and comfortable so I decided to put it through the peanut butter test! I smeared a little peanut butter on my dog’s front paw, sat back and watched him lick it all up within seconds. 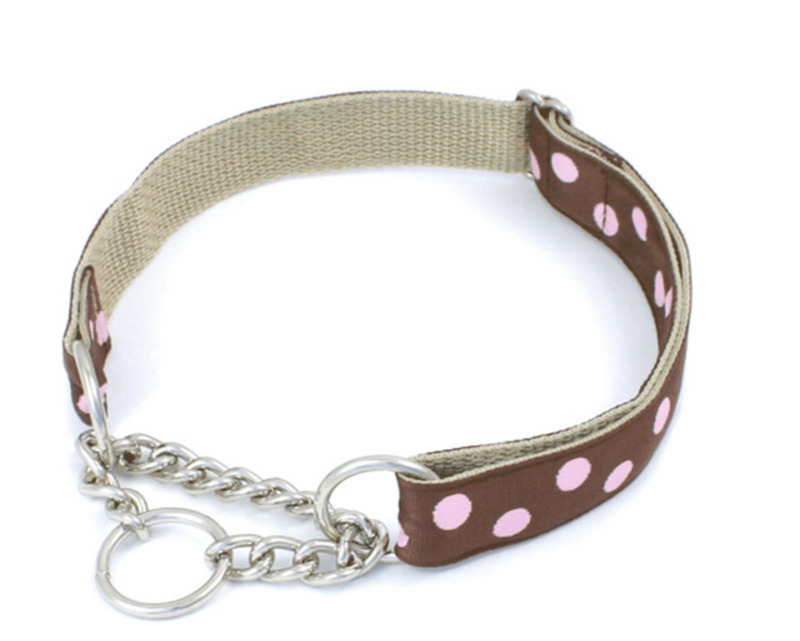 I could only assume that either my dog has a very long tongue, or this type of collar is not great for paw injuries. But I wasn't going to give up just yet. 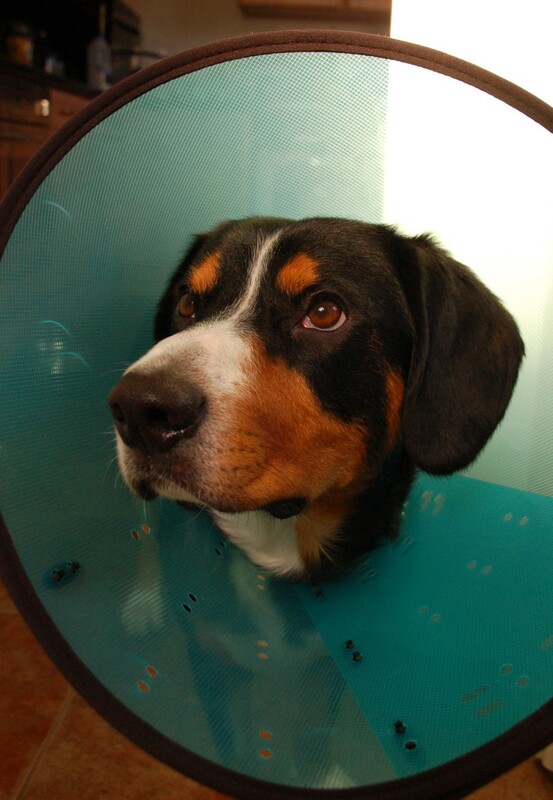 The more important job of the collar would be to stop him from ripping the stitches in his genital area. I will spare you from seeing the photos, but lets just say that he could reach the peanut butter there just as easily as he could anywhere else on his body! All in all this collar was a very comfortable alternative to the cone, but only if you're looking for a floating device or travel pillow. It didn't actually stop my dog from licking any part of his body! I was of course very disappointed with this result as I've seen other dog owners raving about how good this collar can be, but can only assume that my dog is either too flexible or long tongued for this type of collar. Comfort - will your dog like wearing it? Safety - Will it stay on? Cuddles - Can you reach? The more stars the better the collar is! I hope you found this review useful and that it helped you find an alternative to the dreaded cone of shame. I would really recommend buying and trying out these alternatives before your dog needs surgery, or has an accident. That way you can be sure you have found the most comfortable option for your pooch, and he will be used to wearing it before he really needs to. What's Your Experience? Take the Poll! 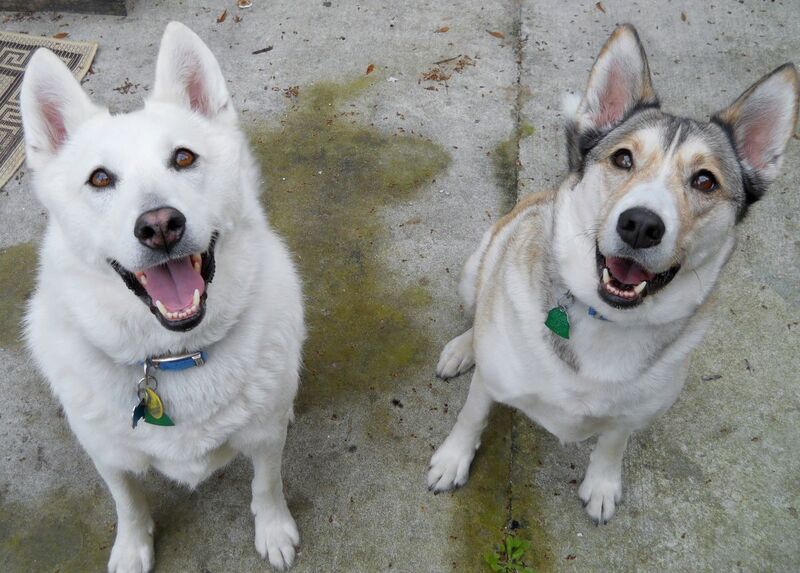 What Type of Protective Collar Would you Recommend to a Friend? I need help for my dog. Holly is an 11 year old Rhodesian Ridgeback with end stage cancer who has licked her abdomen raw. Her condition won't improve and I will not put something on that makes her miserable like the e collar has done after previous surgeries during her final month or two with us. I end up changing her dressing multiple times per day since she is skilled at removing it. I've tried ace wraps, doggy diapers, gauze wraps with a lot of tape around it and she still gets access to her wound within a few hours. I'm going to try a t shirt today, but any suggestions for what else I can do would be helpful. Thank you. 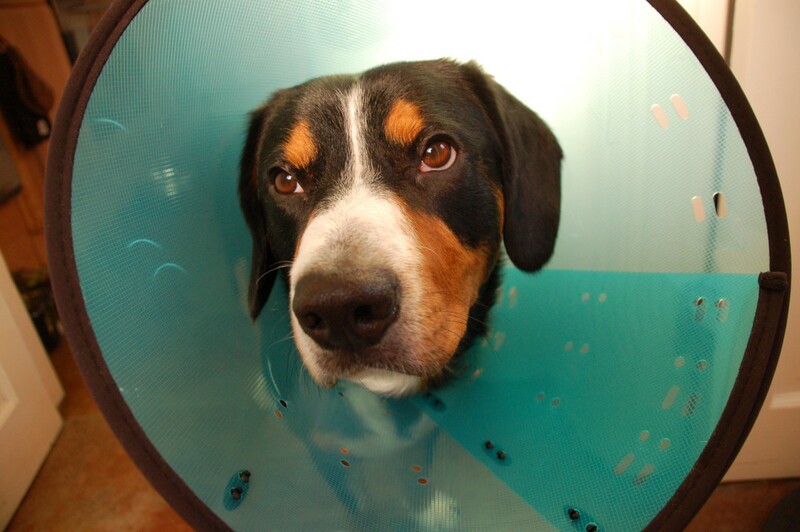 I'm looking for a cone for a dog with a corneal ulcer. Can they rub their eye with the inflatable cone? We bought the inflatable collar . Our dog got out of it constantly . Finally chewed it up while we were at work . That was an expensive lesson , after her spaying . The soft one flip back and she can reach the stitches . We are trying boxer shorts and a belt . Finally , the plastic cone is the only solution sorry people I know it's a pain , for all but it will keep them from biting their stitches . It's only a week . Kelly be careful with the donuts that are filled with air… The number one complaint is that they leak and pop. Our donuts are filled with foam which provides added comfort, the weight helps keep your pet as calm as possible in an already stressful situation and pet parents don't have to worry about coming home from work, waking up in the morning or anytime your pet is unattended and finding them with a deflated doughnut around their neck serving no purpose at all. Also with allergeries being a reoccurring issue I would suggest purchasing a product that is going to last so that you were always prepared and your cat is safe and comfortable . Visit www.puppupkitty.com for more information & use code PETHELPFUL at checkout for 15% of! Actually, your review if the inflatable collar is helpful for me. My 10yo cat has allergies, and has licked his chin/chest area pretty raw. While I've been working on getting the allergies under control (with the help of another nifty device, a pill popper, or shooter), he still has raw areas that he's licking due to dry skin. It looks like that pillow would sit right on top of that area, keeping him from making those patches worse while we're waiting for the Zyrtec to take over. And if it leads to more naps, all the better. Thanks for your reviews. Thanks for the advise. This means that the dog can still reach the incision site if spayed/neutered? Ben is it the 3m cone that has the Velcro? I really like the idea of them but it fell short on the type of plastic (it can shatter), the binding around the neck is crazy hard, lacking binding on the outside edge and no way to attach to a collar. Email me at info@puppupkitty.com and I can go over a few alternatives. 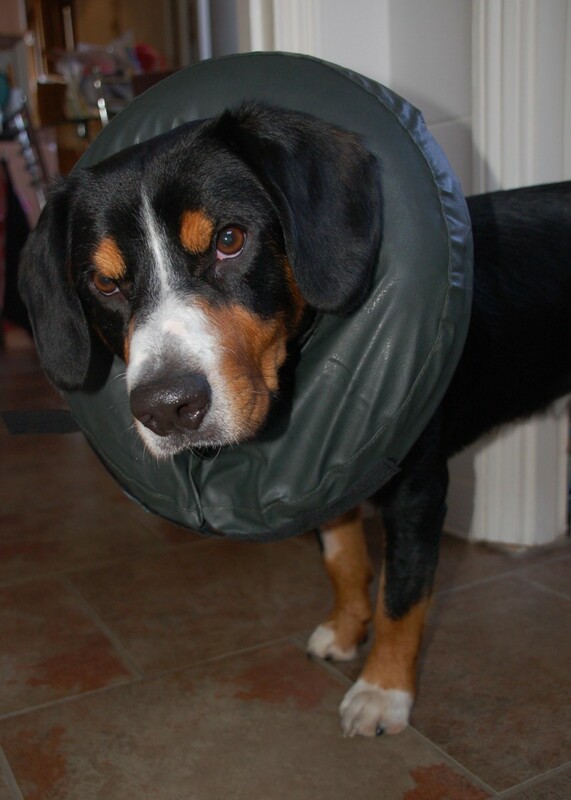 Our comfy collar (the donut) is filled with foam so you do not have to worry about it popping or losing air. We have used 3m transparent e-collars. They are rigid but she can see through it. I was looking for something more comfortable, but as this review states, these cushion based units are not too reliable. given the hard plastic collar by the vet and stayed up all night with him crying. Finally took it off and sprayed his paws, put socks on him and put tape at the top of his legs. We went to sleep and in the morning found he had removed the socks and was licking his paws. I ha a Lhasa apso who has ulcers in both of his eyes He has a plastic cone which he hates. I need something to keep him from rubbing his eyes. He has short legs. Which collar w you advise me getting? The plastic cone scares him when he walks. He just stands there I have t carry him everywhere he weighs about 26 lbs. Can u help? Really Good Collection of collar and today i get the more info about collar so i impress this collar. Thanks for popping by Patricia! 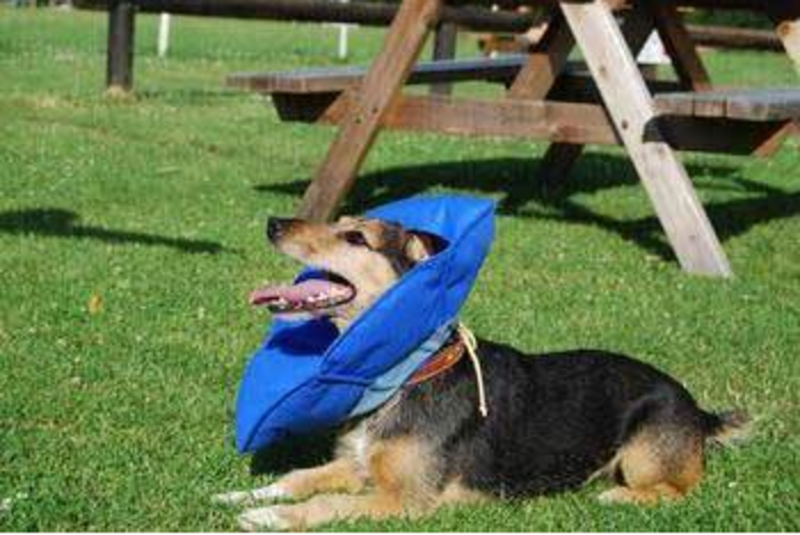 Good to hear that the inflatable collar worked for your dogs, what breeds are they? I have a pet theory that perhaps the inflatable collar works better for smaller breeds? I have found the the inflatable collar works really well if you are trying to keep a dog from chewing on his back. 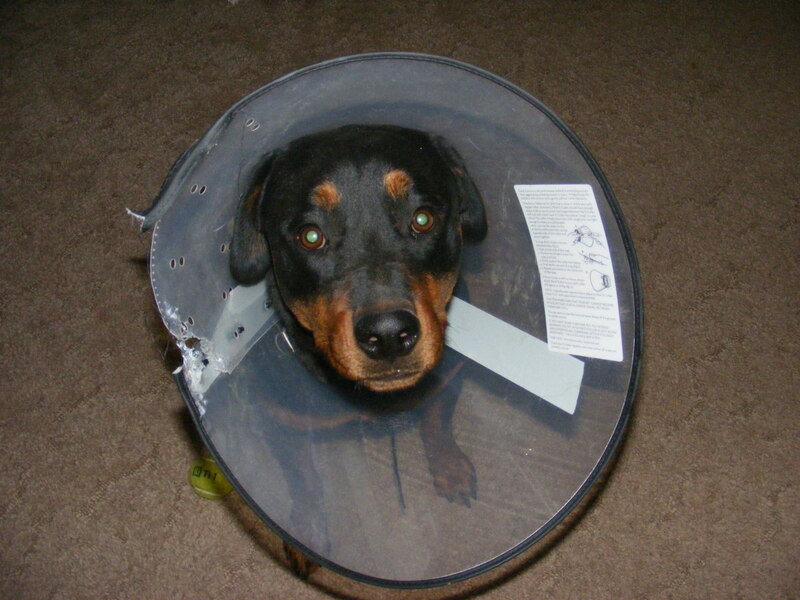 I have dealt with dogs with horrible allergies for years who have to wear an e-collar on a near constant basis. The inflatable collar kept them from being able to chew on their backs. 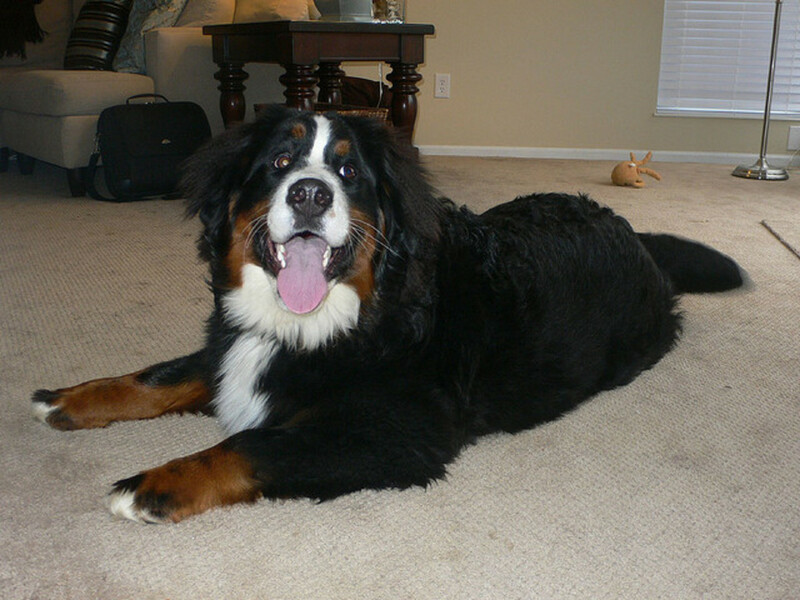 Cute dog by the way! Great well researched hub. Dogs do seem miserable with those shameful collars on. Don't think we ever needed one. Voted up , interesting and awesome. It figures that the comfy one was too good to be true :) My dog was able to get past the traditional e-collar when she was chewing on her tail . . so 24 hour surveillance was the only alternative! i like your dog it good.